Saint Rocco Catholic Church - Stained Glass Inc.
Cardinal Justin Rigali has recently overseen the dedication of a new church building in Avondale, Pennsylvania. The St. Rocco Catholic Church is the first parish designated by the Archdiocese of Philadelphia as a national parish. While most parishes serve a territory, a national parish serves the needs of an ethnic group. In the case of St. Rocco's, it is set to serve the needs of the Hispanic community. The construction of St. Rocco was made possible by the donation from Rocco Abbessinio, a Glen Mills, PA businessman. The 500 seat Spanish-style church features a stucco exterior, tile floor and 11 stained glass window inserts. Designed by KCBA Architects of Philadelphia, the church was inspired by the famed Mission San Juan Capistrano in California. Mr. Abessinio took an active role in helping select and design the stained glass artwork for the church windows. Samples of the stained glass windows were provided along with full color "proofs" so that the decisions could be made by the church committee. The original plan had been to reuse antique church stained glass from closed churches, but the cost of resizing and reworking the old glass to make it work was prohibitive. Concerns about the possibility of lead exposure from the old windows were also a factor. The church decided on new, lead-free Stained Glass Inc. inserts. "Sacred spaces require a high level of refinement in the design of the artwork. Stained glass windows should be more than just beautiful, they must be compelling works of art that draw the faithful into a deeper awareness," said Lyndon Stromberg, whose company, Stained Glass Inc. created the stained glass windows. "We were honored to be able to create the windows for the St. Rocco community." With window inserts, the church was able to use commercial windows in the construction phase and install the stained glass at the end of the process. This allowed construction to not be delayed while artwork was being selected and refined. It also allowed the benefits of standard commercial windows to be combined with stained glass. The new church now features ten windows set high in the side walls. 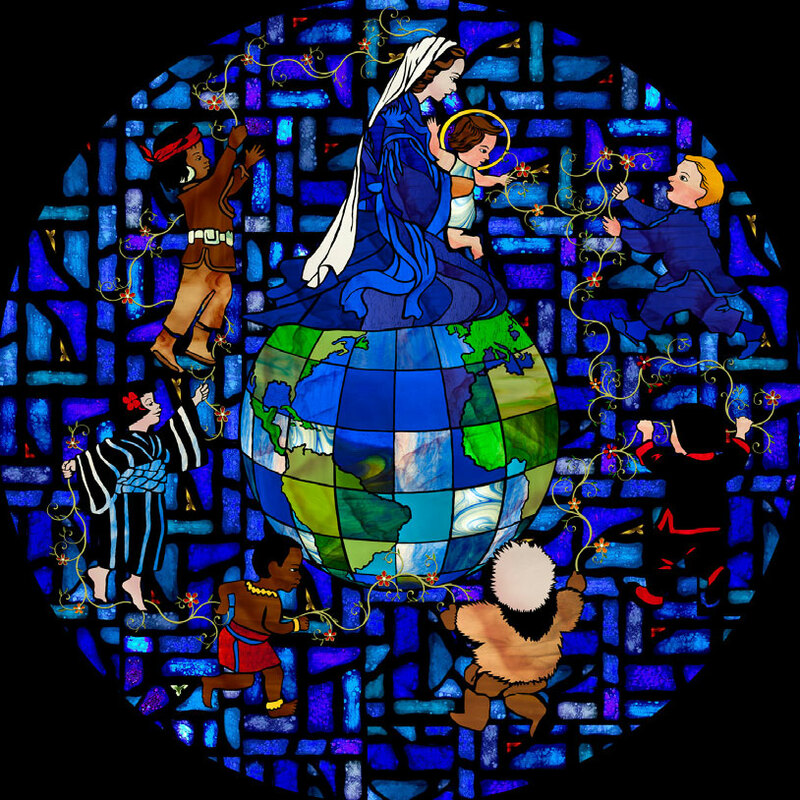 Over the entryway of the St. Rocco Church is a large round stained glass "rose" window of Mary surrounded by the children of the world. Visitors can experience the beautiful light that shines through the stained glass windows and will be inspired by the sacred images. The Stained Glass Inc. church windows are designed by skilled artists and illustrate biblical events and concepts that will motivate the Saint Rocco congregation. The celebrants were happy with the new windows. The windows are outstanding in every way, just awesome. On the day of the church dedication the press was there to cover the event. Father Frank Depman told CBS news that the community is thrilled. "Oh, everybody's overjoyed - everybody's very happy, excited." said Father Frank. At Stained Glass Inc. we specialize in custom church stained glass window panels. Creating beautiful stained glass windows for Saint Rocco, is what we are here for. We would love to work with you on your project and help your church shine with the look of its own one-of-a-kind stained glass artwork. Give us a call today and let us help you get started.